Learn how to reset network adapter in Windows 10 and how to use Network Reset to reinstall network devices and fix Windows 10 network connection issues. Have you ever come across a situation when you desperately want to search something on the internet but you are not able to because your internet connection doesn’t work without any reasons? Or, any circumstance like when your WiFi connected but no internet access on Windows 10 computers? Well, our desktop computers and laptops are machines and due to wrong settings, sometimes it is possible that these machines start malfunctioning really bad. If your internet connection has stopped working and you are not able to browse anything on the internet then you need to troubleshoot the internet connection which you are using. But there are times when you are not able to fix internet connectivity issues by making some of the most basic changes like restarting your PC and trying to connect again, unplugging the power cable for the router from the power source and plug it back after waiting at least 30 seconds, removing the battery from the modem and inserting again. Even sometimes, running the Network troubleshooter, updating the network adapter driver, temporarily turning off firewalls, temporarily turning off any antivirus or malware-prevention software, uninstalling the network adapter driver and restart methods seems to fail. In such situations as a last resort, you can go with Windows 10 Network reset which will reset all your Windows 10 network adapters completely. Over the past few weeks, we received many requests via emails and comments from our readers asking how to reset network adapter in Windows 10 PC and that’s the main reason we came up with this network reset Windows 10 tutorial. If you’re also one of those users who is having problems getting connected to a network on Windows 10 computers and can’t get onto the Internet, follow the below explained instructions to learn how to reset network adapter using Windows 10 network reset. Once again, we would like to remind you that using network reset should be the last resort you try in your network troubleshooting process. Consider using Windows 10 Network reset if the basic things to try first and methods like update network adapter drivers, run the network troubleshooter followed by networking commands, reinstall the network adapter driver and restart etc. don’t help to get you connected. Resetting network adapter will help you in solving internet connection problems you might have faced after upgrading from a previous version of Windows to Windows 10 OS. One you use network reset to reinstall network devices, it will remove any network adapters you have installed on your PC and the settings for them. And after your PC restarts, it will reinstall all your network adaptors, and set other networking components back to their original settings. Step (1): First of all, go to the Start button and then click on the Setting icon to open the Windows Settings. Alternatively, press Windows + I keys together to open the Windows Settings directly. Step (2): On the Windows Settings, click on the Network & Internet category. Step (3): On the Network & Internet window, go to the Status section and then scroll down and click on the Network Reset option. This will remove then reinstall all your network adapters, and set other networking components back to their original settings. You might need to reinstall other networking software afterwards, such as VPN client software or virtual switches. 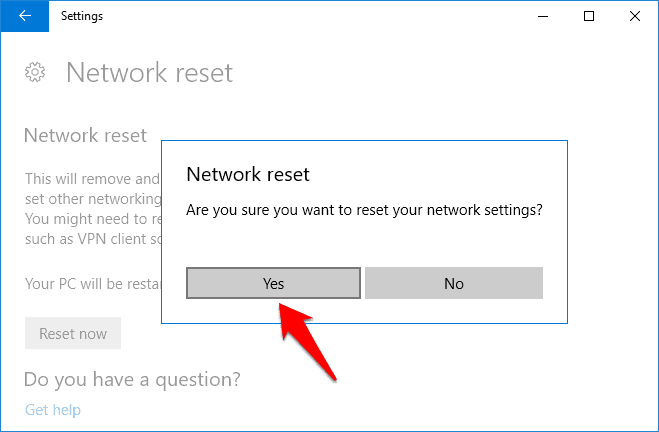 Step (5): If you are fine with everything and want to proceed with Windows 10 network reset then simply click on Reset Now option. Step (6): Just after the click, a confirmation pop-up will appear asking “Are you sure you want to reset your network settings?” Just click on the Yes button to continue the network resetting process. Step (7): Now, you will see a notification on your computer screen saying your system will shut down in 5 minutes. So, just Close the notification and save anything you are working on your PC before the time expires. Don’t worry, this is just a reboot which needs to be done in order to reset the network adapter. Important note: In case, if you don’t want to wait for 5 minutes to get your PC restarts automatically then you can also restart your Windows 10 computer manually. The result will be exactly same. Step (8): Once your computer is rebooted, you will see that Network adapter has reinstalled and you will be asked to configure it back again. You will also be asked if you want other devices to discover your PC. By following the on-screen instructions you will be able to reconfigure your Windows 10 network adapter settings. After using Network reset Windows 10, you might need to reinstall and set up other networking software you might be using, such as VPN client software or virtual switches from Hyper‑V (if you’re using that or other network virtualization software). Now that you have reset network adapter on your Windows 10 computer you shouldn’t experience internet connectivity issues. We hope that now you are able to reset all your Windows 10 network adapters and start from scratch by following our guide how to reset network adapter in Windows 10 using network reset. If you are having any other network connection issues, reset network adapter Windows 10 problems or still unable to reset Windows 10 network adapter then do let us know using the comments section below. Always remember, if all your other Windows 10 network adapter troubleshooting efforts have failed then a full network reset might be just the most appropriate answer.